I have recently identified, with some satisfaction (being a beginner in this field), an example of the smallest British land mollusc. 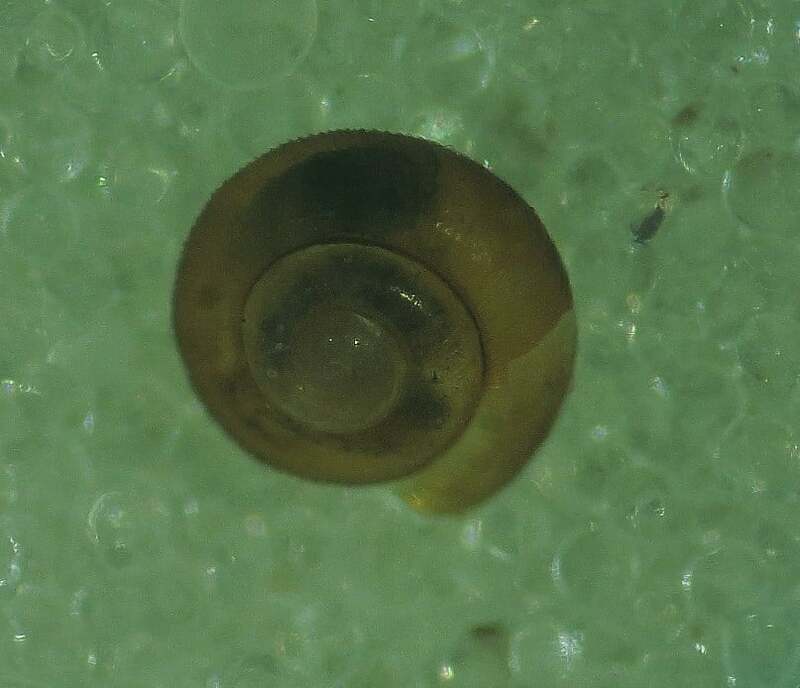 It was in a batch of snails collected by Stephen Moran at Kearvaig, near Cape Wrath (NC2972) on 23rd August, and is appropriately named the dwarf snail Punctum pygmaeum. When fully adult it reaches a diameter of 1.5 mm, but this example was just 0.64 mm across. It is a miracle that Stephen even saw it amongst the rather larger insects he was sampling with his suction collector in an area of ‘sedgy dunes’. Fortunately, the shell has a good diagnostic character when seen under a low-power microscope; the growth rings are raised into sharp ridges, giving it the appearance, in profile, of a tiny fine-toothed cog-wheel. I know that Cape Wrath is well outside Assynt, but the species has been recorded locally: from Ardvar (NC1833) and the eastern end of Loch Assynt (NC2423) in 1977 by Martin Willing; from Inchnadamph (NC2521) in 1998 by Dorothy Marriott; at Ardvreck Castle (also NC2423) in 1996 by Barry Colville. The mollusc Atlas (Kerney, 1999) says tellingly ‘under-recorded owing to its minute size’. So, something for the keen-eyed to look out for locally, amongst leaf-litter in woodland, as well as marshes, grassland and the wetter parts of dunes.